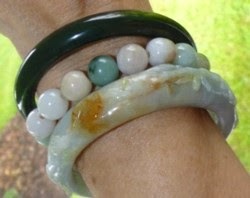 One of the questions I get regularly: should I wear my jade bangle on my right wrist, or my left wrist? Which wrist is best for wearing a jade bangle bracelet? Your left wrist is closest to your heart, and if you wear jade the traditional way for wellness and qi balance, then the left wrist is the best wrist for a jade bangle bracelet. In the past, only wealthy women could afford to have jade bangle bracelets. And wealthy women didn't have to work for a living. But in our modern every day living, wearing your jade bangle bracelet on your dominate arm could expose it to more possibilities for damage. So take that into consideration when deciding which wrist to wear your jade bangle on. And you do need to decide which wrist you want to wear your jade bangle on before you purchase a jade bangle bracelet. That's because most women's hands and wrists are not the same size. And a few mm size difference can make a big difference how your jade bangle fits. I personally wear my every day jade bangle all the time on my left wrist, because I like it closer to my heart and my left is not my dominate wrist. Since I wear jade for health and wellness, when I need a different color of jade for balancing my qi, I wear either a jade pendant with the qi energy, or wear another jade bangle on my "other" wrist. Sometimes I even wear two jade bangles on the same wrist, with a gold "spacer" bangle between. For example, when I travel I want to wear deep deep green "black" jade for protection, both physical safety and from contamination. So I either wear a black jade pendant, or one of the Chinese jade "black" jade bangles on my right wrist. If you are a jade bangle lover, you might want to wear more than one jade bangle at a time, so you can wear two or more on the same wrist. Be careful because if they hit each other just right (what I mean is "just wrong!) they may crack or break. I like to wear a "spacer" to protect them. I have two 24K gold slender bangles I sometimes wear between the two bangles. But I prefer to wear a jadeite beaded stretch bracelet between two jade bangles. The natural color of the jadeite beads "goes" with almost any color of jade you have. And looks and feels awesome.